View the artwork of renowned painter Marinus Welman, and it quickly becomes apparent that he and his work can’t be categorized. Like his paintings, which depict a wide variety of subjects, such as the Civil War, Big Sur, Death Valley and horses, it is impossible to pigeonhole the Dutch painter, who has worked and lived in Orange since 1972. If you were to call Welman anything, it would be a painter, who is also a historian. His artwork, which consists of oil paintings, drawings and sculptures, encompasses the tapestry of life—from the horrors of the Holocaust, to the fierce pride of the American Indian, to the turbulent North Sea, breathtaking California Coastline and raw strength of ironworkers. A subject frequently covered in Welman’s work is war and its effects. This theme stems from his growing up during World War II in Amsterdam. “I was born in 1934, and the war started when I was five,” says Welman, who always knew he was an artist. “When I was very young in grade school, I became popular drawing cartoons of teachers with huge noses covered in warts,” he says. With the war, schools soon closed, however, and the young boy’s world became about somber subjects like starvation, bombings and diphtheria. “My art early on reflected how we lived at the time,” says Welman, who with his brother collected food from trashcans and farms outside of Amsterdam, at the same time discovering shrapnel and pieces of airplanes. “I did paintings of unavailable foods from a cookbook, including birthday cakes for my mother,” says Welman, who also read about the foods to his family. After the war when Welman turned 14, he started formal art training at the Kunstnijverheids school in Amsterdam and later attended sessions at the Akademie van Beeldende kunsten Amsterdam. When he was 17 and 18, he collected impressions for his art by sailing the world’s oceans on a wild freighter left over from the war. “We sailed all over the world carrying cargo, including through the Suez Canal, and we visited the United States on several occasions,” says Welman, who after his travels packed up his paint-box and moved to California at the age of 21. During his more than 50 years in California, Welman has captured many forms of the state’s raw beauty, including Big Sur, which he considers the most inspiring coastline of the world, and locally at Holy Sepulcher Cemetery in Orange and Laguna Beach. He has painted in all kinds of weather conditions, including the Santa Ana winds, which “make things look silvery.” Recently he donated artwork to Chapman University. The two large paintings from his “Earth” series are his “imaginary view of the earth from space” and contain materials such as sand and dirt from a variety of locations, including Death Valley and Riverside County. It is the artist’s wartime experiences as a child, however, that in many ways permeate his work. 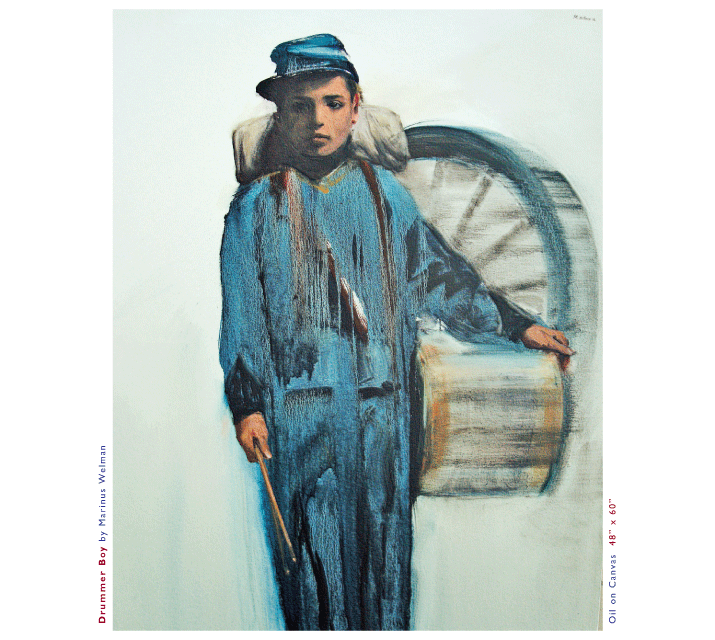 “War has occupied me always,” says Welman, whose painting in this issue portrays a Civil War drummer boy oil on canvas he painted in 2006. “I learned about the Civil War when I came to the U.S. and was drafted and stationed in South Carolina from 1957 to 1959,” he says. “I discovered that the drummer boys were the first to be shot during battle, and as a war child myself that vulnerability made a deep impression on me. The young boy in the painting shows on his face a combination of fear, bravery and innocence.” The technique Welman used in the painting was inspired by photographic smudged glass plates common during the Civil War period that have deteriorated over time. The painting has a similar smudged and faded look to indicate the past. Welman’s most graphic and intense works are his interpretations of the Holocaust, including a series of seven Nazi generals in full dress and framed in iron. A larger piece named “Auschwitz Interlude” was inspired by a photo he saw of Germans responsible for gassing people, who were taking a break and enjoying accordion music. “The women appeared to be dancing and that struck me,” says Welman of the painting that has a red background indicating fire. “The painting is good, yet the subject is horrible.” He has also done paintings of inside gas chambers. “The intense experience of reality motivates and animates my art,” says Welman. “This reality offers a billion artworks ready for the taking. More than I could ever execute in a lifetime.” Which doesn’t mean that he won’t try. 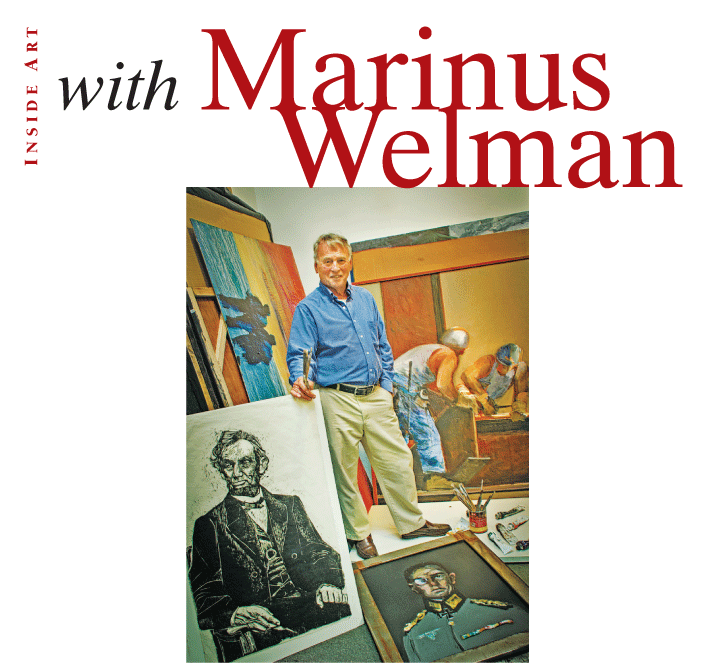 For more information about the artist and his work, visit marinuswelman.com.